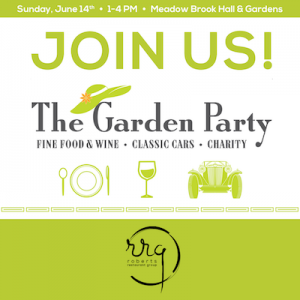 On Sunday, June 14, 2015, all of the Roberts Restaurant Group restaurants spent an afternoon on the grounds of Meadow Brook Hall & Gardens at The Garden Party, an annual fundraising event featuring food, wine and classic cars. Hosted by The Garden Party Foundation, this event successfully raised money to help provide trade school scholarships to underprivileged young adults so they can develop the skills necessary to build a self-sustaining life. Throughout the afternoon, Roberts Restaurant Group served up great tastes designed exclusively for The Garden Party. Guests came from far and wide to sample items from Beverly Hills Grill, Bill’s, Cafe ML, Roadside B&G, Streetside Seafood and Town Tavern – as well as from many other local restaurants, all paired with wine from some of the finest wineries. Click here to learn more about The Garden Party and future events.